Like their counterparts in Hollywood, film studios in China are not only where movies and TV dramas are made, but also popular tourist attractions. Starting from this issue, we take a look at some of the most important film studios in China that are open to tourists, begining with Hengdian Studios, the biggest movie studio in China and dubbed as "Chinawood" by Western media. CHINA is a country full of superlatives, and the Hengdian World Studios, one of the largest movie studios in the world, is certainly one of them. A few hours' drive from Shanghai in neighboring Zhejiang Province lies an exact replica of the sprawling Forbidden City, the vast Emperor Qin's Palace , the last imperial courtyard, old Hong Kong streets and rows of palaces from the Ming (1368-1644) and Qing (1644-1911) dynasties. The gargantuan film studios with 13 shooting bases covers a total area of 330 hectares and has 495,995-square-meter of built-up area. Since 1996, Hengdian Studios has welcomed more than 300 film makers, and provided the sets for more than 5,000 movies and television shows. It is where movies like Ang Lee's Oscar-winning "Crouching Tiger, Hidden Dragon," Zhang Yimou's "Hero" and "The City of Golden Armor" and Chen Kaige's "The Promise" were filmed. But perhaps the widest exposure Hengdian will get is when "The Mummy: Tomb of the Dragon Emperor" opens in Beijing in August this year. Attracting the blockbuster "Mummy 3" has been the studio's biggest foreign coup to date. With its 10 theme parks lying within in the vast confines of the studios, Hengdian has become one of the hottest tourist attractions for movie fans around the world. 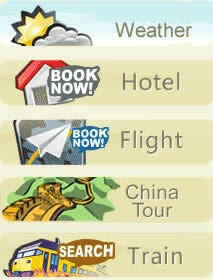 More then 5 million tourists visited in 2007, a rise of 32 percent over the year before. That's more than Hong Kong's Disney World. Walking around the 330-hectare lot of "Chinawood" is like taking a tour of the Middle Kingdom, except somehow better, because many of the life-size replicas on the sets are of ancient palaces that no longer exist, haunting grottos that have long since been re-fashioned, and Hong Kong and Guangzhou streets as they haven't been seen since the early 1900s. Hengdian studios is farmer-turned-tycoon Xu Wenrong's dreamscape. It made the 73-year-old a multimillionaire and changed the fortune of everyone around him - literally. When he started to build his dream in 1996, the rocky foothills around Hengdian were dotted with farms and small factories. Saner heads said he was crazy. Xu went ahead anyway and with only marginally better transportation links today, 83 movie and television crews made the trek to Hengdian in 2007 alone. As a tourist attraction, the lure of Hengdian is seeing the meticulously crafted, full-scale replicas of some of China's most important cultural sites, but the fact that you might also catch a glimpse of Jet Li, Michelle Yeoh or Jackie Chan is a strong selling point, too. The amazing thing about Hengdian is just how real the sets are. The Forbidden City set looks almost more appealing than the actual Qing and Ming palaces in Beijing. The Ming and Qing Dynasty Palace covers 100 hectares and cost more than 700 million yuan (US$94.6 million). It is an exact replica of the Forbidden City in Beijing. The real gem at Hengdian is the Qin Dynasty (221-206) palace. The palace, covering more than 40 hectares, was built for filming the movie "Emperor and the Assassin" in 1997 and it was also the setting for "Hero" in 2002. 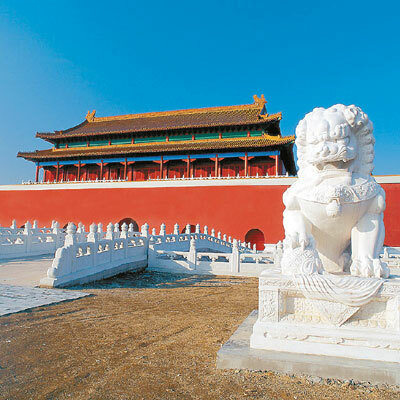 There are 27 magnificent palaces and an 18-meter-tall, 2,289-meter-long city wall. The main palace is 44.8 meters high, showing the majesty and authority of the Emperor Qin who unified six countries and turned them into one big, powerful one. It's been as faithfully rendered as possible from books and paintings and there is nothing like it left anywhere in China. Xi'an has Qin ruins, but only at Hengdian do you get a sense of the splendor of the early empire. There are also many blocks of Beijing "hutongs," or alleys, from bygone days. A few still exist in the capital, but they are knocking them down so fast to accommodate the swelling urban population (and the Olympics) that Hengdian may soon be the only place where you'll be able to see how for centuries ordinary Chinese lived. Xu hasn't quite finished "collecting" Chinese history for his movie studio. He hopes to begin construction this year on a controversial replica of the gardens at Beijing's Old Summer Palace that were destroyed by Anglo-French forces during the 1860 Opium War. Purists, and there are many in Chinese academia, have loudly argued that recreating the gardens will make people forget the "scar left on the back of the Chinese nation" by the Western powers. Hengdian is a five-hour drive south from Shanghai, although Hangzhou airport is much nearer, around a two-hour drive. Tickets: Prices range from 20 to 90 for each theme park. A package that allows visitors to every theme park cost 330 yuan in winter and 380 yuan in other seasons.